The Auto Marketing Blog: Toyota Marketing Goes on Defensive to Disprove "Expert"
Toyota Marketing Goes on Defensive to Disprove "Expert"
It's one thing to issue a press release or respond publicly to criticism about your company; it's a whole other thing to start advertising your response to a crisis. Let's call this Crisis Marketing, my borrowing a phrase common from Public Relations - Crisis Management. If you don't know about Toyota's massive, very public recall situation than you are not paying attention. Toyota is suffering a barrage of recalls affecting several vehicles. One of the more damaging recalls is the sudden acceleration issue many consumers are saying they are suffering. This is all very reminiscent of a similar situation Audi went through back in the 1986. I had a neighbor with a beautiful Audi 5000 that was parked on a descending driveway that we all thought was sure to suddenly accelerate and plow into his garage door, at least that was what we 14 year-old kids wanted to see, but it never happened. In fact the whole Audi sudden acceleration situation was user error due to a pedal placement design, not faulty electronics. Audi was often criticized for how it responded to their crisis by constantly saying how there was no sudden acceleration situation in their product and it took years to show there wasn't, but unfortunately the public perception damage was done and it took a decade or so for Audi to repair its image. Toyota is trying to do that same repair and is even marketing how the sudden acceleration demonstration performed by David Gilbert for an ABC News story was a false demonstration not using the actual Toyota product design. Toyota responded with a press release stating it has, "raised serious concerns about the validity, methodology and credibility of a demonstration." What's most interesting to me as a marketer is how Toyota is getting their story to their consumers. Toyota has bought an ad network buy to get some banners out to tell their side and publicly discredit Gilbert. The ads feature Professor David Gilbert with copy calling Gilbert a "critic of Toyota electronics." Gilbert isn't identified by his professional title as an automotive technology professor at Southern Illinois University. To Toyota he is a critic of the company. 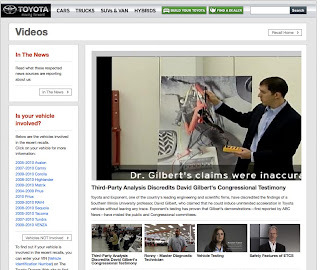 Then when a person clicks the ad they are taken to a landing page full of content showing why Gilbert's demo is false and Toyota's position on the sudden acceleration issue, plus their response to help concerned customers. It's all an interesting implementation from Toyota. Instead of letting the "experts" define the issue, Toyota is fighting back with its marketing dollars to regain some ground and not let what they consider misinformation fester and contribute to a long damaging reputation similar to what Audi experience 20 years ago.